2017 was a year for the record books. For the first time ever, global stock markets posted positive monthly returns for 12 straight months, a remarkable achievement. Additionally, it did so with few moves to the downside, which is perhaps surprising when one considers the flurry of geopolitical events that occurred in 2017. Improving economic growth in the U.S. and even more so abroad contributed to this result. In fact, according to the most recent International Monetary Fund data, only a handful of countries experienced negative growth in 2017, and this was limited to crisis-stricken countries such as Venezuela and South Sudan. While U.S. economic output measures are not in for the fourth quarter yet, we did have two quarters of above 3% growth for the first time in several years1 . With this synchronized growth across the globe and financial markets following suit, it is perhaps not surprising that investor confidence and sentiment indicators are very high. Markets don’t usually reach all-time highs in a steady march throughout the year. In fact, most years see an average intra-year drop of 13.8%. However, 2017 saw pullbacks of less than 3%. Such a small intra-year decline has occurred only one other time in the last 30 years (1995)2 . Furthermore, investors seemed to view every small dip as an opportunity to buy more stocks rather than a reason to sell, which represents a very different mood than has existed in recent years, where even small market corrections were feared to be a precursor to another 2008. What has changed? Investor sentiment. Investors in general seem quite confident in financial markets’ ability to continue producing positive returns. 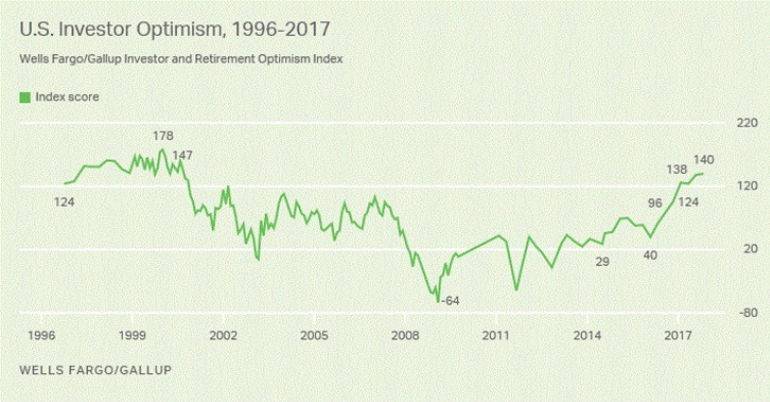 Statistically, investor sentiment has increased tremendously, with one measure reaching a 17-year high and approaching levels last seen during the dot-com boom3 . This data point may be concerning for those of you who experienced the downturn that followed the dot-com boom. It is worth noting that stock valuations today are lower than they were in the late ‘90s. While this doesn’t guarantee safety, it is worthwhile context. The point remains that investors are currently feeling quite optimistic. Stocks across the globe did well, with all Paracle-managed stock categories providing returns in excess of 20%. Foreign small companies and emerging market stocks were stand-outs with returns in excess of 30%. Growth categories on average outperformed U.S. large stocks by 6.6%. We have a sizeable commitment to categories that we expect to provide higher growth than U.S. large stocks over time. These categories include U.S. small companies, foreign small stocks, and emerging market stocks, and our combined exposure to these categories is 3x the level represented in the global stock benchmark. 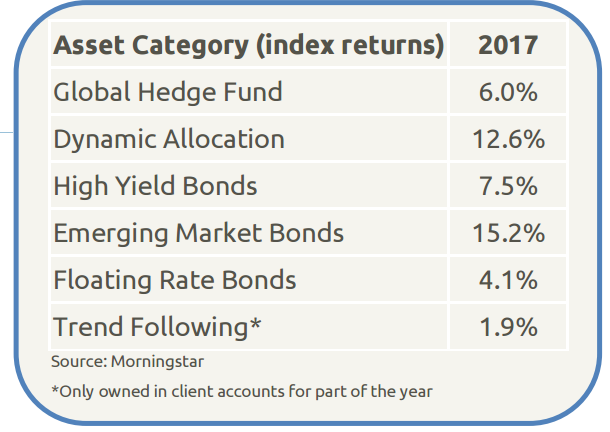 Over the several years prior to 2017, these categories had not provided meaningful outperformance relative to large U.S. companies. With investor sentiment still recovering from the Great Recession experience, investors were simply more comfortable investing in the largest, most established U.S. companies. Now, with higher confidence in the global economy, growthoriented investments are finally being rewarded. Foreign investments outperformed. Economic growth was even stronger abroad than here at home. Coupled with a weakening dollar, this resulted in a great year for foreign stock investments. For the first time in 5 years, all foreign stock categories outperformed U.S. stocks. The falling dollar contributed a full 10% to returns in foreign developed markets and about 7% in emerging markets. Emerging market companies were the top-returning category, which is especially encouraging to see since this category has lagged U.S. stocks in recent years, causing some investors to question the merits of the category. We continue to believe that emerging markets will provide strong growth opportunities as economic growth remains strong and a consumer-oriented middle class develops. Many investors were surprised to see intermediate term bonds post positive returns in a year where the Federal Reserve increased short term rates several times. However, this result is actually somewhat common. 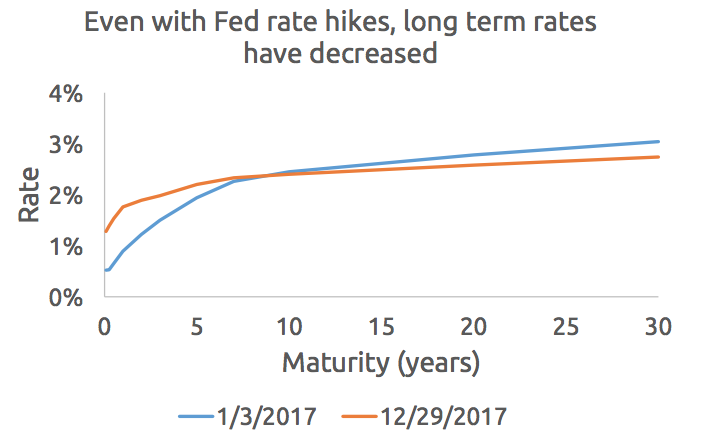 In recent Federal Reserve hiking cycles shorter term rates have typically edged higher while intermediate term rates have remained relatively stable. The Fed’s measured pace and size of rate increases has been helpful in not upsetting bond markets. As an additional consideration, anxiety seems to be lessening over the Fed’s decision to begin selling assets that it acquired in the unprecedented actions it took during the Great Recession. Over the last several years investors had worried about the repercussions of this eventuality, fearing that selling these assets would upset the bond markets. However, the very gradual reduction that the Fed has begun has so far had little impact. We recently had the opportunity to attend a luncheon with Ben Bernanke, who was the Fed chairman during the financial crisis and the creator of the Fed’s “quantitative easing” strategy. Bernanke estimates that the Fed’s asset sales should only affect interest rates by 0.1% incrementally beyond the effects of usual rate hikes. 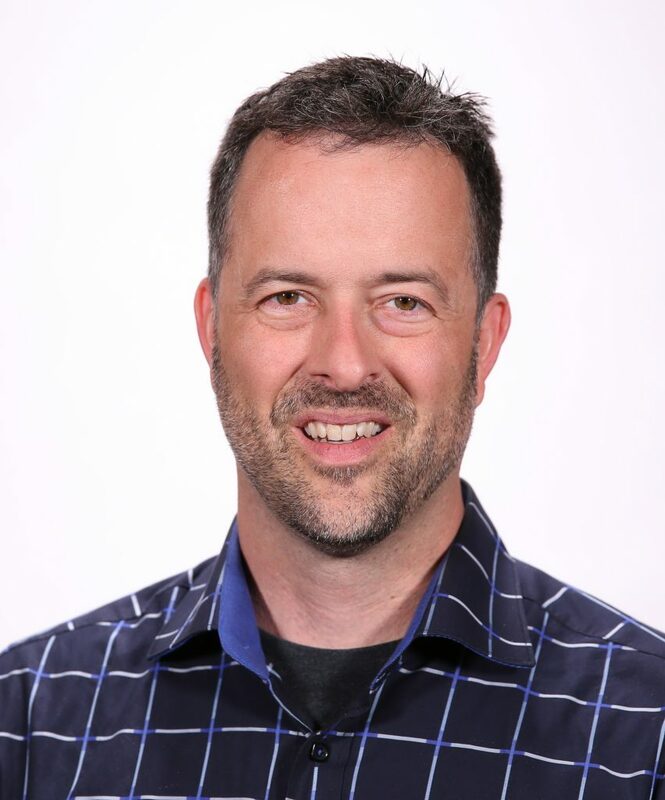 In other words, he believes that the impact should continue to be minimal. A significant unanswered question is: What will finally spur higher yields for longer-term bonds? In a typical economic cycle, inflation tends to occur during periods of strong economic growth, and this inflation drives bond yields higher. However, the current recovery is somewhat unique insofar as it has provided strong economic growth without a corresponding increase in inflation. Another factor at play is the fact that U.S. bond yields are higher than foreign bond yields. (In fact, ultra-safe U.S. Treasury bonds currently even yield more than much riskier European high yield bonds, which is shocking.) Foreign investors seeking higher yields have invested sizeable assets in U.S. bonds, which has likely kept domestic interest rates compressed at a lower level than they would be otherwise. We would expect to see a decline in bond values if domestic inflation rates increase significantly or if overseas interest rates move higher. Non-Traditional investments turned in a return between that of stocks and bonds, which is in line with our expectation. Notable contributions to this performance came from strengthening in emerging market bonds, high yield bonds, and floating rate bank loans. All of these categories benefited from improving global economic expectations. We completed a review of the Non-Traditional asset class in 2017 and determined to add new exposure to a category called trend following. The addition of trend following is expected to further diversify the portfolio from risks in the traditional stock and bond markets, even having the potential to perform well when stock markets are falling. Since this exposure was added in the later part of the year, it is not reasonable to evaluate its performance over the entire year. However, it was nice to see these investments get off to a good start in the 4th quarter. With investor sentiment running high, trends are strong, and these investments have been performing well recently. Taking it all together, 2017 was a great year. 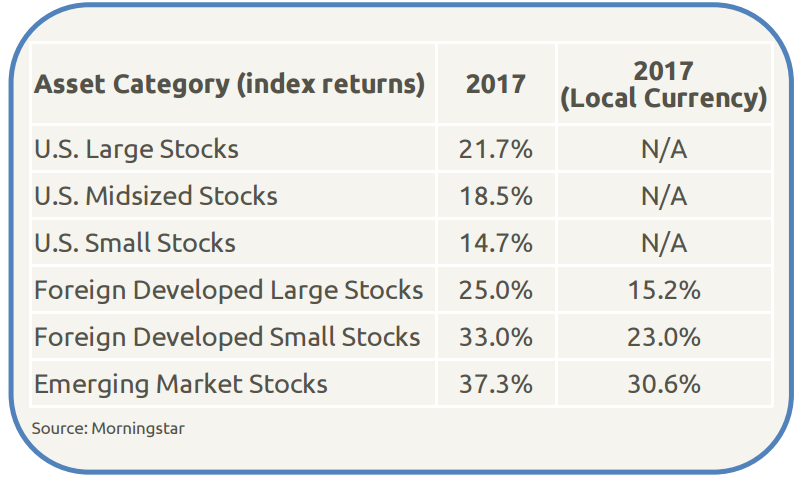 Stocks categories returned from 20% – 34%. Bonds were positive as well, returning around 4%. And non-traditional investments provided returns in the 6% – 8% range. Moreover, 2018 is off to a great start and positive momentum driven by strong investor sentiment shows no sign of slowing down. Not to bring a wet blanket to the party, but it is worth noting that sentiment does eventually turn. We don’t ever try to predict when investment moods will change, but we do constrain risk by maintaining portfolios within strategic targets and trimming categories that have exceeded thresholds. With this in mind, don’t be surprised if we reach out to you and suggest that it is time to rebalance. We are not betting against the market, especially since positive sentiment and momentum often run for a while. Rather, we are simply keeping your portfolio from growing too risky. As the saying goes, pigs get fat and hogs get slaughtered. Indices: Global Stocks: U.S. Large Stocks—Russell 1000, U.S. Midsized Stocks—Russell Mid Cap, U.S. Small Stocks—Russell 2000, Foreign Developed Large Stocks— MSCI EAFE, Foreign Developed Small Stocks—MSCI EAFE Small Cap, Emerging Market Stocks—MSCI Emerging Markets; Non-Traditional: Global Hedge Fund— HFRX Global Hedge Fund, Dynamic Allocation—Morningstar Tactical Allocation Category, Emerging Market Bonds—JPM Emerging Market Bond Index, High Yield Bonds—Barclays U.S. Corporate High Yield, Bank Loans—S&P/LSTA Leveraged Loan, Trend Following—SG Trend Index; Bonds: Intermediate Term Tax-Exempt Bonds—Bloomberg Barclays Municipal 5 Yr, Intermediate Term Taxable Bonds—Bloomberg Barclays U.S. 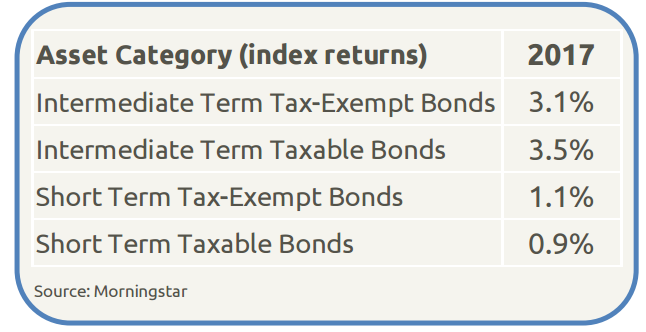 Aggregate, Short Term Taxable Bonds—Bloomberg Barclays U.S. Aggregate 1-3 Yr, Short Term Tax-Exempt Bonds—Bloomberg Barclays Municipal 1-3 Yr.
Disclosure: Due to various factors, including changing market conditions and/or applicable laws, the content may no longer be reflective of current opinions or positions. Moreover, you should not assume that any discussion or information contained here serves as the receipt of, or as a substitute for, personalized investment advice from Paracle Advisors, LLC. To the extent that a reader has any questions regarding the applicability of any specific issue discussed above to his/her individual situation, he/she is encouraged to consult with the professional advisor of his/her choosing. Paracle Advisors, LLC is neither a law firm nor a certified public accounting firm and no portion of this content should be construed as legal or accounting advice. A copy of the Paracle Advisors, LLC’s current written disclosure statement discussing our advisory services and fees is available upon request. Paracle Advisors is an investment advisor registered with the Securities and Exchange Commission. As a partner at Paracle, I am responsible for setting firm-wide standards, with a specific focus in the area of our investment approach. I also continue to directly serve some families. Continuing to have a hand in daily client work helps keep my perspective grounded in the real world of client experiences, which unquestionably helps to keep our investment approach practical.